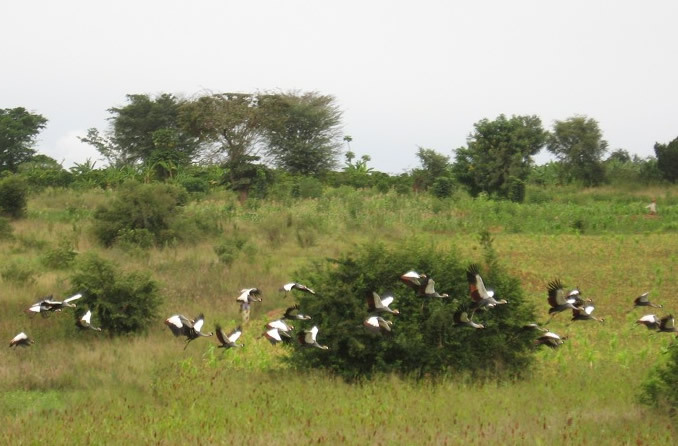 This Ramsar wetland is situated in Central Uganda within Masaka district, approximately 120 kilometers south-west of Kampala City and currently encompasses a linear swamp on the floor of the Nabajjuzi River Valley. Nabajjuzi covers an area of 21.44 square kilometers (2144 hectares), has an elevation of 1200 to 1300 meters above sea level and stretches north-wards along the Nabajjuzi Valley for 40 kilometers from Masaka Town to its confluence with the premier swamp of River Katonga that flows into the vast Lake Victoria, hence making Nabajjuzi one of the tributaries if the Katonga River basin. The Nabajjuzi wetland is mainly characterized by cyperus papyrus and dotted by Miscanthus violaceus while the small open water pools allow the growth and survival of the Nymphaea nouchali var. caerulea. This area is characterized by Cyperus papyrus dotted with Miscanthus violaceus in majority of the parts of the wetland, the interior of the wetland supports communities of Kostchya, a common shrub in this kind of Papyrus swamp while the margins have Cyperus denudatus, Alchornea, Pennisetum purpureum and phoenix reclinata and many others. Even with the long history of resources being extracted by the surrounding local communities, some areas of this wetland have remained relatively intact and authentic with the flora and fauna species as it used to be in the past. It is obvious that the growing use of wetland products for subsistence and commercial use has contributed to the increased levels of harvesting and several surrounding areas have been modified and developed into trading centers and small Towns which has in turn increased the demand for the wetland recourses hence over exploitation. The Nabajjuzi wetland offers shelter to several mammal species including the sitatunga, a swamp-dwelling antelope that is globally threatened and specie of national importance. 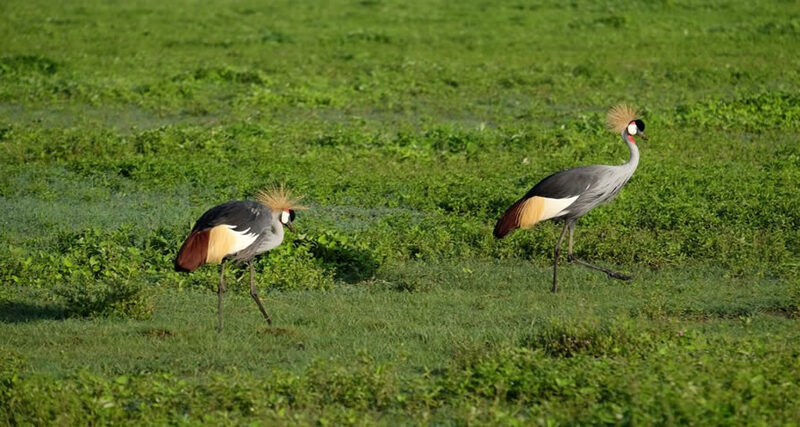 Additionally, the wetland is an Important Bird Area sheltering several threatened and vulnerable bird species such as the Papyrus yellow warbler, shoebill storks and the Papyrus Gonolek but is also a home and breeding zone for the exceptional Grey crowned crane, Uganda’s National Bird. Mud fish (Claris mossambicus) and Lungfish (Protopterus aethiopicus) are some of the extraordinary fish species that call the Nabajjuzi wetland home, and the fish are the main source of protein for the local communities around the wetland and Masaka district in general. Besides the exceptional attractions, Nabajjuzi wetland is the main source of piped water for the people of Masaka Town but one of the challenges is the nearby tannery that discharges effluent into the wetland which is less than 400 meters from the water extraction and treatment plant. 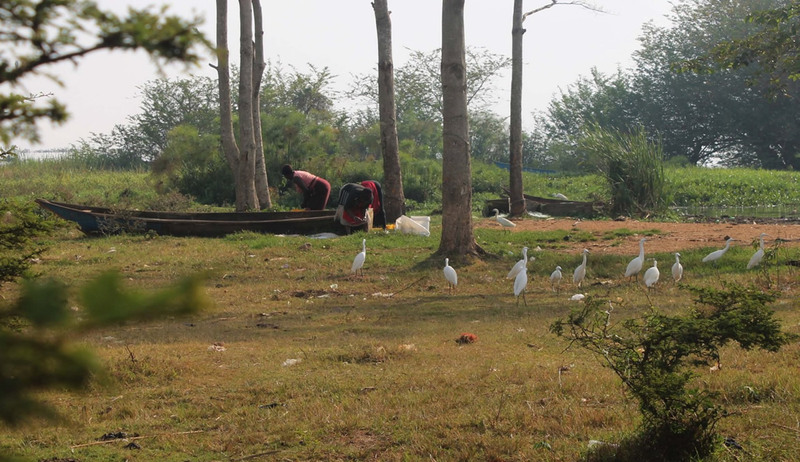 However, the high population around the southern part of the wetland is mainly characterized by the sub-urban residents of Masaka district and the other Townships whereas the communities in the northern part are mainly rural with subsistence lifestyles but both communities depend deeply on the water from the site with the latter using the wetland for grazing but also harvest several swamp products for medicine, thatching and crafts. Nabajjuzi wetland is found within the native Buddu County, one of the popular counties within the large and culturally blessed Buganda Kingdom and most of the fauna and flora species here are attached to the cultural norms and traditions, especially totems of the people of Buganda. This entry was posted in Budget Uganda Safaris. Bookmark the permalink. What to see and do in Akagera national park?